The custom playing card wizard makes it easy for you to create a deck custom poker playing cards with your photo on them. The process is simple and it starts with you choosing which photo you want from your computer. Next, you can position and resize the image so it looks exactly how you want it. 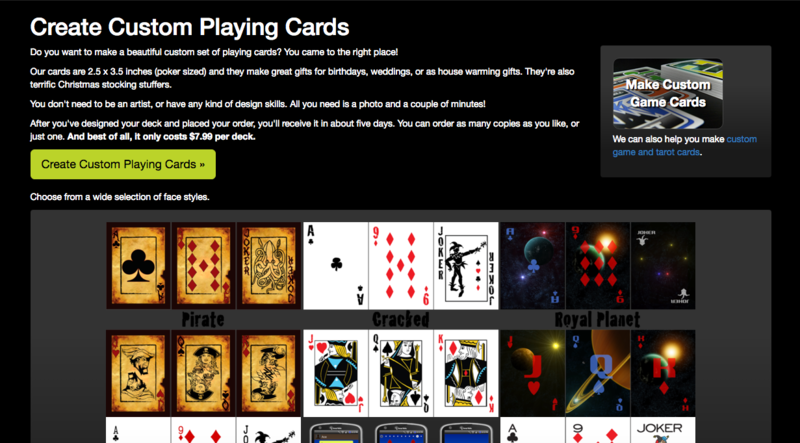 Finally, you'll choose which poker card style you want for the front of your cards. Several examples of our designs are below. NOTE: If you want to make a custom game or tarot cards you are in the wrong place. The page you are on is for making custom playing cards with the traditional suits of hearts, spades, clubs, and diamonds. Click here if you want to create custom game cards instead.